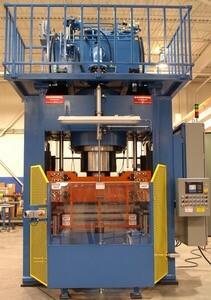 This 650-METRIC TON CURE PRESS is designed to produce high quality brake parts with maximum efficiency. The machine is equipped with several safety gates and switches to ensure maximum operator safety. The machine is equipped with manual and automatic programs. The programs are designed to provide maximum flexibility to the customer. The customer can input/modify various parameters for the manufacturing process of brake parts on this machine, using the display screen on the operator’s panel. WATER @ 2 GAL/MIN @ MAX. 85 DEGREES FAHRENHEIT. ADJUST FLOW RATE ACCORDINGLY WITH RISE IN TEMPERATURE.